★★★★☆ Very comfortable and sound is consistent and strong. I use them at the gym with my cell phone so not to bother other members. Like them and would highly recommend. Had a little trouble connecting to Bluetooth but then again I'm technically challenged also. ★★☆☆☆ These headphones are great and fit real well on me. They are soft and have great audio and there weren't that expensive. I would recommend this to my friends and family, but after ONE day of use it would not charge. I tried many ways and different USB plugs and such to charge it and it wouldn't do it. I even sent an E-mail to the group to see if i can solve the issue myself and they haven't responded back to me yet. I think i just got unlucky with it but it still doesn't excuse this major flaw with these headphones. I still like and use them with the headphone jack but i cant use the Bluetooth feature which is why i bought these. I would have been better off getting a more expensive one that are reliable. 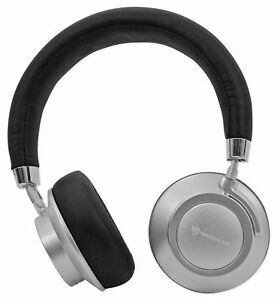 ★★★★☆ Great headphones for the price. Been using them for a few days at the gym and no complaint with sound and quality. Only complaint or issue is that they won't fit people with bigger than average heads. I don't have the biggest head but it's not small either. This BARELY fits me at adjusted at maximum size. I own many headphones and every headphones fit me fine adjusted at about 3/4 of maximum size. Just something people might want to consider. I wear a cap 7 1/2 for reference. ★★★★★ These headphones have sounded good on every type of music I've tried, as well, they've been great for spoken language. They paired easily with both my android phone and my laptop with Win 10. I am very pleased with all aspects of them. ★★★☆☆ Very nice-looking product. Connects easily with bluetooth devices. Sound is good. But I would imagine, that for comfort, the manufacturer would have considered the adjustability of the headphones to be important. Apparently not.